The dog days of summer have arrived, but luckily they’re not all that “doggy”. 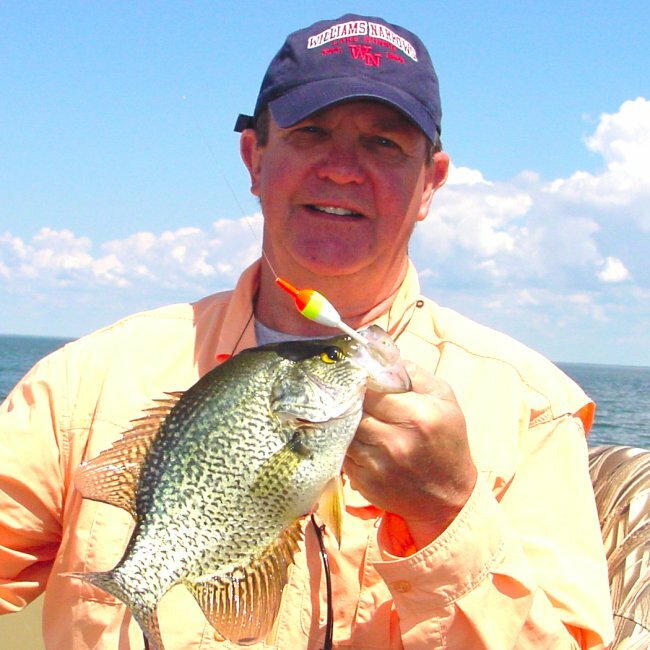 Even though fishing isn’t at the peak of action right now, there are plenty of reasonably good bites going and anyone who’s willing to put in a little effort, can count on getting some fish. Our weather has been generally warm, even hot on some days. But unlike the 2006 season, we get a cool down about once each week giving us a break from the heat and keeping the water surface temperatures on either side of a stable 75 degrees. Mid seventy degree water is warm enough to keep decent Bass and Panfish action going, but it’s not warm enough to kill the Walleye bite, so for now all options are open. Walleye fishing for me has been centered on three main patterns this week; Shallow weedlines, Mid depth flats with rock cover and main lake humps and bars. There have probably been more Walleyes available on the shallow weed lines than anywhere and that’s been my main focus especially on breezy days. Jig and minnow fishing produces the most action. So for the Walleye, Perch and Pike combo I’d probably suggest that. 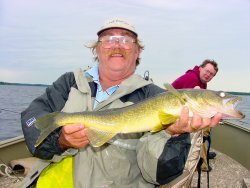 If your fishing preference were Walleyes or bust, then I’d suggest a live bait rig or tiny jig head tipped with Leeches and/or night crawlers. We’ve had to keep our speed under control (.40 to .60 MPH) on the weedlines so if it’s breezy, a drift bag has been a must. Windy days have been my time for trolling crankbaits. The Salmo Hornets are still producing fish for me and the #5 sizes trolled 50 to 60 behind the boat in 10 to 12 feet of water have worked fairly well. The color preferences on these rocky areas have been the oranges, browns and perch patterns. If this is your favorite style, you may stick with it and still pick up a few fish during calm periods, but for me, when the wind dies, the crankbait fishing slows down too much and I don’t bother with it during calm periods. When it gets calm, the deeper main lake bars humps and sunken islands are still holding fish. Lindy Rigs, 6-foot snells and the liveliest leeches and crawlers you can find will do the trick. I do have to cover some ground to find the right spots though and I’d say that maybe every third or fourth hump I look at has some fish on it. If you’re going out deep, I’d recommend planning to fish enough spots to make it pay off. The Bluegill action on the deeper weedline has been fairly good this week too. If you move slowly in and out of the weedline trolling a live bait rig tipped with a small to medium leech, you’ll find pockets of fish. Once they’re located, you can stop and concentrate on the school using small jigs tipped with pieces of cut bait. Worms, leeches and cut night crawlers are all working equally well. Lots of the Grand Rapids area lakes offer the multi action bonus pack too. 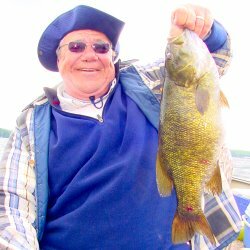 You might easily find Perch, Bass, Walleye and Pike on the same weedline. Cash in on the action when you get the chance and you’ll have a great trip. Pike and Musky fishing has probably been the least exciting this week. The cooler nights and storm fronts that have moved through keep the fish from getting really active. 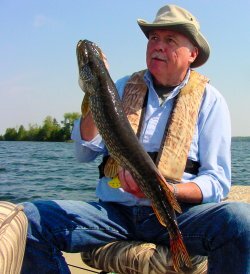 We’ve been able to “scrounge” some fairly decent Pike, but no really big ones and while we’ve had some success getting Muskies to follow, they haven’t been active enough to bite. We have a full moon coming soon and I’m hoping that this triggers some better action. The fish that we have seen and caught have responded best to the Bucktail spinnerbaits like Lindy’s M& G Bucktail or the Northland Bionic Bucktail. We add a trailer to the tail hook that seems to help. Large twirl tails jiffy frogs or double tails are all good. Best colors for me have been the Yellow/Lime and Black/Orange combinations. Bass action has been above average to excellent during the past couple of weeks. Depending on the day, Largemouth Bass on the deeper weed edges adjacent to shallower feeding flats. When we find areas that have both weeds and rocks, the action is best. 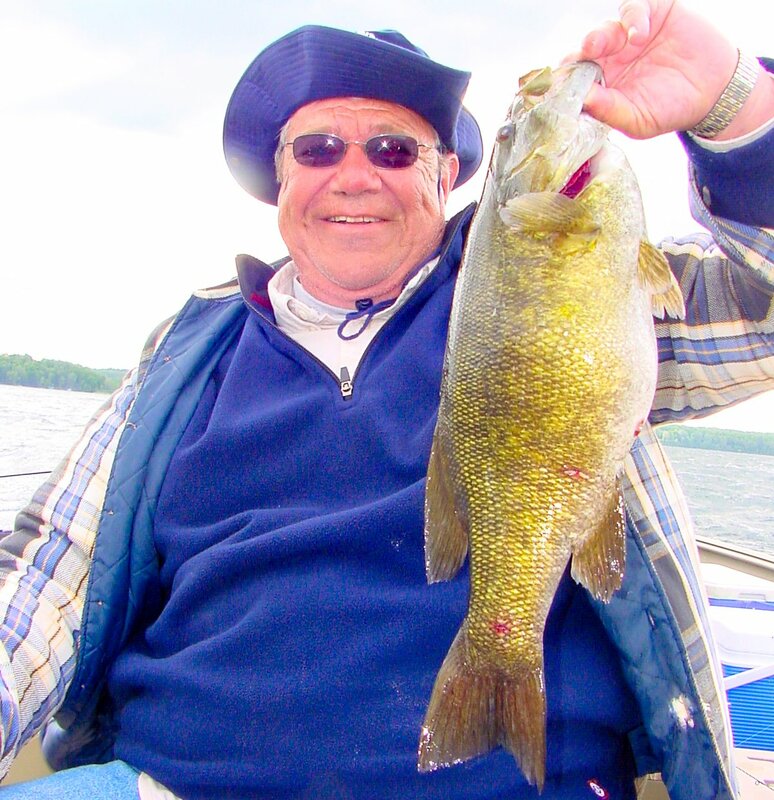 Smallmouth Bass have been using the deepest portions of the weedlines and rocky points in deep water. They’re not quite as active as the Largemouth though and if you really want to zero in on the Smallmouth, live bait might be the best way to catch them. Live bait rigging with 5 to 7 inch Sucker minnows, creek chubs or golden shiners will put some fish in the boat. Avoid feeding line with the rigs, just let the fish have a moment to inhale the bait and set the hook with a gentle, sweeping motion. This really helps cut down on injuring the fish and aids in releasing them. Large Bass are one key to keeping the Bluegill populations healthy and they’re a lot more fun to catch than they are to eat. So if you need to keep a few bass to eat, do the lake a favor and utilize the smallest fish for food and leave the larger ones behind to do their work. The hot weather has returned and surface water temperatures are back above 80 degrees on many of the Grand Rapids area lakes. 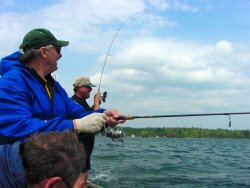 I wouldn't want to call the Walleye fishing great, but if you spend some time on the water, there are fish to be caught right now. We've had enough cool nights and a few cold snaps this summer that combined with low water, have left most area lakes in a somewhat clearer condition than they were last summer. so far there hasn't been much evidence of any stress on deep water fish or any sign of a fish kill. 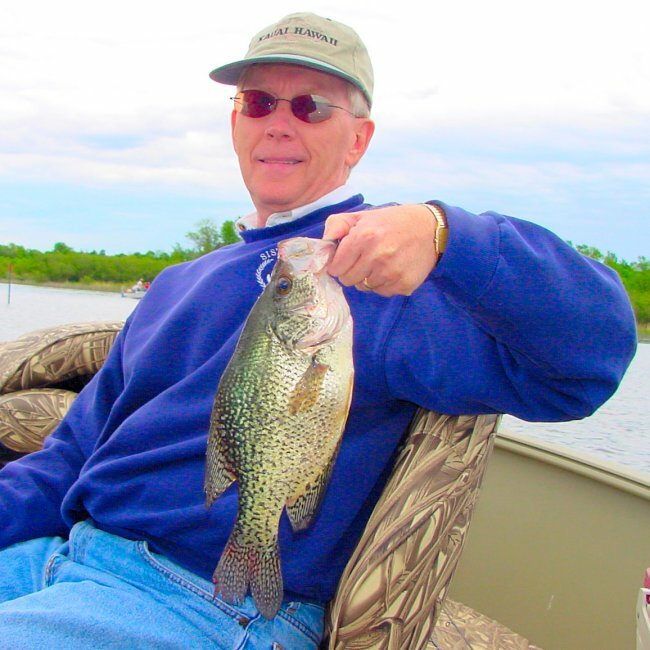 On calm days, there are still fish to be caught on deeper mid lake structure. Windy days create some action in the shallows, especially on rocks and mixed gravel weedlines. Lots of folks remember fishing in the area last summer when the water heated up and Walleye turned their attention to crankbaits. If you've been waiting to try that again, it looks like your time has arrived. We've noticed a few differences between the previous season though as there are fewer fish suspending on the flats. With more fish relating closer to the bottom and hanging tighter to structure, we've had to fish a bit deeper using deeper diving crankbaits. One pattern that I've been using the past few days has been fishing just outside rocky stretches where the mid-depth flats meet the shallower rocks. Fish have been holding in anywhere from 9 to 12 feet of water and we're running Salmo #5 Hornets about 60 feet behind the boat and getting down to about 8 to 9 feet deep. We discovered another group of fish yesterday in about 14 feet of water and caught some of these fish with the old style Fat Raps. These baits get down to about 16 feet and run with a tight wiggle similar to the Salmo's. Color in the Orange/Brown/Gold patterns have been better for me. Well folks, the last three or four days have been quite a challenge for anyone trying to cash in on the Summer Peak Walleye bite. It started Sunday with a line of severe thunder storms, lightning and high winds. The follow up was a cold front with high winds from the West and Northwest that have lasted for the past three days. Water temperatures have dropped somewhere around 5 degrees from the mid 70 degree neighborhood down to the high 60's and lower 70's. The Walleye fishing that had been really good last week, has been sluggish as we struggle to find a new pattern emerging after all of the turbulence. Fish have been widely scattered with some deep, some shallow and some suspended out over open water. Good news though, it looks like we have a more stable weather pattern on the way and my guess is that a recovery in the Walleye action is on the schedule for the next few days. If you're in the mood to hunt for large fish, you should still have a couple weeks of prime opportunity. Main lake bars, sunken islands and deep shoreline structure will be the key places to look for fish feeding on the insect larvae and accompanying baitfish that key on the larvae hatching on and near soft bottom flats adjacent to these deep structures. Live bait rigs with healthy leeches and crawlers are better now than jigging, but we still catch some fish on the jig and minnow especially when fish are located on rocks. It appears that new fish moving out into deeper water keep feeding on minnows for a time. Maybe because they're used to feeding on them in the shallows and it takes a while to "kick the habit" or maybe it's just a coincidence, but after the fish have been deep for a while, the jigs don't seem to get their attention any more. Lots of anglers in the Deer River area have chosen not to fight the wind and have spent the week zeroing in on Bluegills instead. Sunfish that were on the beds a week ago have moved out into the weeds in 5 to 9 feet of water. There may be some movement back onto beds for a few fish, but it's getting pretty late now and I imagine that we're looking at the start of the mid summer patterns. We should be starting to find Bluegill action in the deeper weeds this week and with a more stable weather pattern the action should be good. Bass, especially Smallmouth have started moving deeper as well. We battled the high winds on Tuesday as we fished for Smallmouth and discovered that the deep water was better now than shallow water. We didn't catch numbers on this go around, but we were rewarded for the effort with nicer size fish. 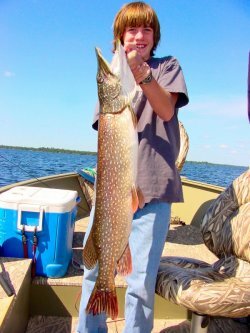 Northern Pike of "above average size" are starting to show up consistently now as the spring run of suicidal small fish seems to be tapering off. Not a minute too soon, as the ol' jig supply has been severely depleted recently. The nicer Pike have been on deep weedlines in the 15 to 25 foot range. Sharper points, rocks and Cabbage weeds have out produced most other structure, but shallow rocks have had a smaller number of decent size fish too. Mid depth gravel and rock areas are just starting to hold some better perch and a warm up will most likely improve this scenario during the next week. Young Crawfish are the key and when you start finding these small newly hatched Crawdads in the Perch's stomachs, you'll know it's time to find the rocks. 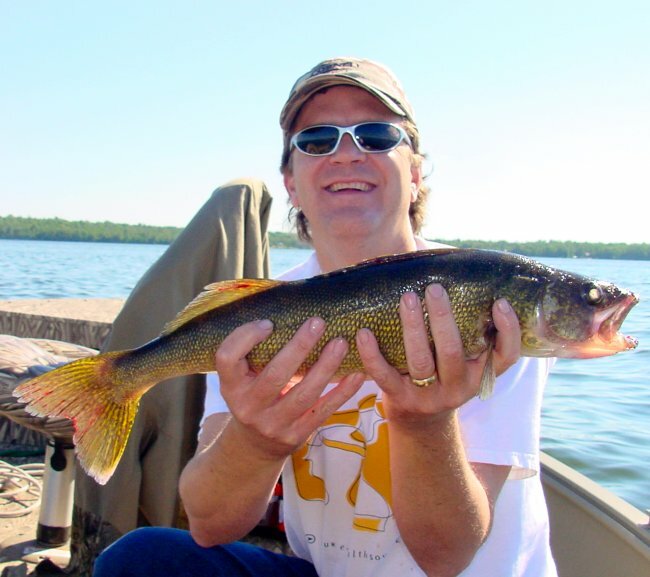 Larger Walleye roam the deeper main lake bars and sunken islands during the "summer peak" fishing period. The next couple of weeks will continue to be prime time for folks pursuing large fish. Not as many eaters, but great opportunity to catch a "fish of a lifetime". I'd be grinning too if I caught this Smallmouth. The deep water action is just starting to pick up now. Better than average Pike are showing up on the deeper weedlines. After catching a pile of pee-wees this spring, it's nice to see some better fish. Not huge, but they are scrappy. It's been cooler than usual this week with typical early June rain patterns back in the mix for 2007. Water temperatures have risen to about 65 degrees, but there have been some setbacks down to the low 60 degree range during rainy periods. So far, it's shaping up to be one of those extended cool periods that keep lots of Walleye in the shallows foraging on minnows. In my opinion, there's nothing wrong with that at all because it keeps the jig and minnow bite alive longer. But if you're happier fishing the deep water with live bait rigs, then for you, things are progressing more slowly than the typical summer. We had a couple of days late last week where it looked like the Walleyes were making a move deep, but during the past 48 hours very few of those deeper fish have been caught. Even then, we caught more fish on a jig and minnow in the deep water than we have on live bait rigs. Leeches have produced a modest number of fish though and if that's your favorite style, at least you won't go home empty handed. The only problem with the extended cool water shallow fishing pattern for Walleyes is that we are more dependent on the wind blowing. When we do get a good breeze, the fishing has been great, but we've had a couple of zingers when the wind lays down and forces us into "scrounging mode". In other words, flat calm has equaled slow fishing. When we've had to face this scenario, my best defense has been to go into the weeds with 1/16 ounce jigs and root around for fish. Moving slowly along the weed edges and pitching the jigs up into the shallow weeds gets us to the fish before they realize we're there and get spooky. If we keep at it, we're winding up with our fish and at times we even hit some moderate schools of fish and have spurts of decent action. Shiners seem to always be the preferred bait, but we have had great action using Rainbow Chubs too. The best jigs are light enough to "float" above the weeds a little. A 1/16 ounce or below average size 1/8 ounce jig have been my favorite. On Wednesday, we even used 1/8 ounce jigs all the way down to 20 feet deep, so if your boat control is good, don't be afraid to stick with the light weights. Panfish and Bass are moving in the shallows right now. Bluegills are on beds and folks are having some great fishing. Crappies don't appear to be bedding, at least not where we've looked so far. But they are catchable in the slightly deeper water near traditional spawning areas. I've had good luck finding them in weeds 10 to 12 feet deep. 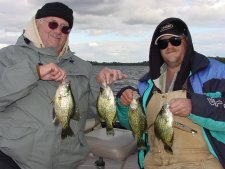 Fishing with slip bobbers, small jigs and medium size crappie minnows. We've made a few trips up to Red Lake for the Crappies there and by picking and choosing the smaller rock humps, catching enough to keep us happy. After everything I said about the cool water and extended shallow bite, I should add that I saw my first sign of a major change on one of the smaller lakes in our area. 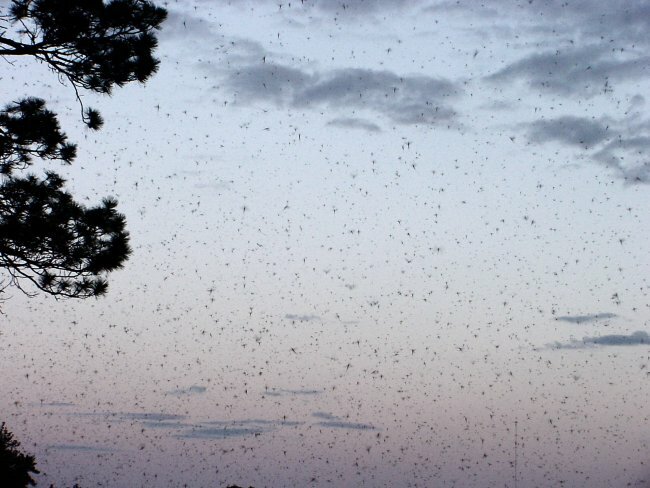 Big time Mayfly hatch occurred there on Tuesday 6-5-07. The big hatch hasn't occurred everywhere, but it's a sign that we should be expecting a sudden change in the near future. I'd expect that one or two warm summer days and we'll experience on of those here today, gone tomorrow episodes. I'll expand on that in the next few days. Until then, good luck. Crappies have been hitting in the 10 to 12 foot water located near good cover. 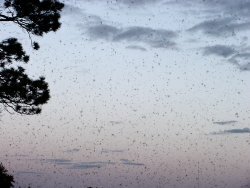 Big time Mayfly hatch already occurred on one Deer River area lake. A couple of warm days and I expect to see more pictures like this one. Memorial Day Weekend 2007 brought us some interesting fishing stories this year. Everything from Wind, Rain, Sunny, Calm, Rough, Smooth and even a twister on the lake to keep our Walleye fishing more interesting. So far the rule of thumb has been the more wind the better. In fact, we've done our best work on the days that wave's were slapping hard against my Wave Wackers. Jig and minnow fishing is still the preferred presentation, but get ready for the next big seasonal movement. 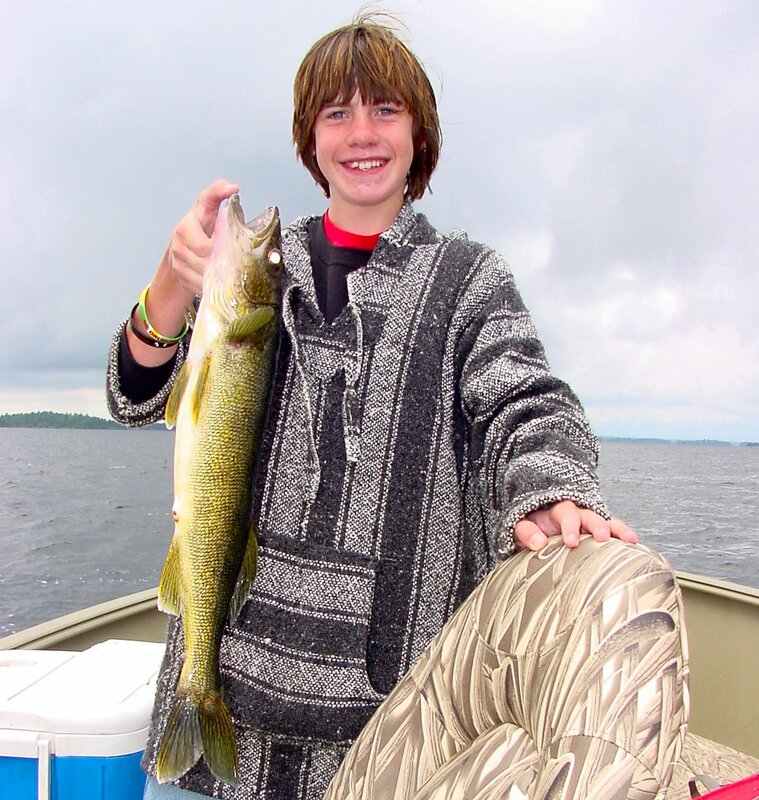 Walleyes are already beginning to stage out on the deeper edges of the expansive shoreline flats. When the wind blows, the fish move in to the shallow weed edges, rocks and sand points to feed. Calm water seems to trigger the famous Walleye disappearing act as the fish back out across the flats and rest until the next prime time feeding opportunity. So far, we haven't had to deal with many of these calm periods, but starting today, I'm carrying all of the makings for live bait rigs, Leeches, Crawlers and slip bobbers. We've already started catching fish that had stomach contents consisting of insects instead of minnows, so it's just a matter of a week, two at most before we'll be looking out deep for our fish. New information is going to trickle in this week, but the summer peak will be here shortly and I expect that the fishing news will be be steadily increasing as new opportunities emerge. 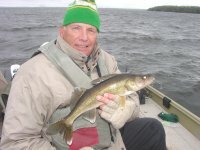 Jigging the rocks with heavy winds has been great for Walleye and even some bonus Smallmouth Bass. The more wind, the better the action! Walleye and Smallmouth Bass both caught on the same rock pile. For early season action, you can't beat this combination. From opener to "snowpener" in one week. That’s right, it’s the same fishing season we started last week with 80 degrees and sunny. We started our fishing day on Sunday looking at air temperatures of 34 degrees and a bit of the spitting white stuff in the air. This is the type of cold front that would really slow down the bite in mid-summer. Luckily for us, the water temperatures are still cool and the effects of a cold front this early in the season is minimal (to the fishing). While I don’t like trying to tie a knot with frozen fingers when it’s this cold, I have to admit that I like the idea of an extended cool water period in the spring. 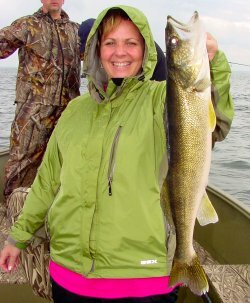 The shallow jig bite for Walleye is one of the most productive times of the season and the colder temperatures do tend to extend it. For the most part, the first week of open water fishing has been typical of any other season. Jig and minnow fishing on the shallow breaklines and weeds have been the best approach all week. Most fish we’ve caught this week have been the expected smaller 12 to 16-inch males with an ample supply of "Slot Fish" from 17 to 19 inches. So far, there have been few larger fish roaming the flats but a few times each day, we’ll catch something between 20 to 24 inches just to make it interesting. We’ve had good wind almost every day and drifting the shallow breakline has been productive. Occasionally during calm periods, we’ve had to start "scrounging" in the weeds for fish. Even places where the weed barley stands tall enough to register on my Lowrance have been enough cover to hold baitfish and therefore, feeding Walleye. 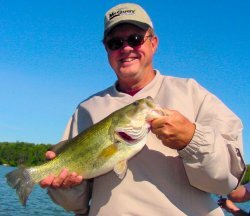 During these calmer periods, try switching from the typical trolling approach to casting or "pitching" your jigs into shallow weed cover and hop-snap retrieving the bait toward the boat. Fish using the shallow weeds are catchable, but easily disturbed. Trolling through the weeds gets you a few fish, but they tend to stay longer if you don’t "spook ‘em". 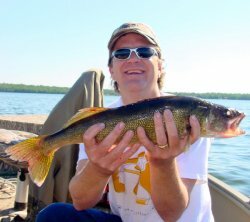 Early in the week, there were already folks catching Walleyes on Leeches so if you like, anchoring on some of these weed flats and fishing with slip bobbers/leeches would be good fun too. On one of the smaller lakes I fished this week, we found that Crappies were mixed in with Walleyes on a couple of the weeds flats too. In the past, we’ve had good success combining the two by bobber fishing using medium size fatheads and rainbow chubs. Jumbo Perch are in their spawning mode right now and we’ve been catching a lot of the male fish, very few females. We’ve gotten enough Perch while Walleye fishing so that I haven’t had to go out of my way to look for them. Weeds mixed with some light rock and/or gravel have been good spots so if you want to single out some Perch, start looking in this type of location. Finally, I'm back in the saddle. The schedule these past couple of months has been hectic to say the least, but we finally made it to the opener and everything in life is good again. 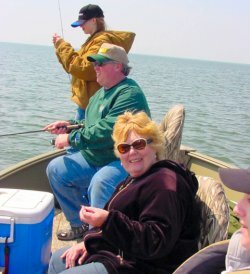 We got the season off to a great start on Saturday with what is now our second annual fishing opener at Red Lake. Thanks in part to the sunny sky and calm water, the action wasn't as hot as we experienced in 2006, but once we got tuned in, the action was steady. We estimated that we released about 2 "slot fish" (17 to 26 inch protected) for every keeper size fish we caught and there was no problem getting our limit of 15 to 16 fish for a nice fish fry. The Walleye have already cleared out of some of the main spawning areas and are scattered around the shoreline in smaller schools. It was evident that the larger females hadn't totally recovered from the spawning runs because we still caught mainly male fish in the 15 to 18 inch size range and the largest fish we caught was about 20 inches. In a week or so, we'll see some larger fish. Our fishing strategy was a bit different this year because we combined the Walleye opener with a field testing session for a new line of non-toxic jigs. The jigs and rigs, "Super Natural Series" hasn't hit the tackle shops yet, so everything we fished with had never been used before. After experimenting with colors and sizes, we settled on few "new favorites" and as our confidence grew, the fishing got better. The best action for us came on lighter jigs 1/16 and 1/8 ounce sizes were the best producers. Color didn't seem to be critical, but we had good success on the blue/silver, green/orange and red/yellow. As the water warmed up we had to jig more aggressively to get the fish interested. Swimming or dragging the jigs didn't do much, but give it a good thump, keep it hopping and then the hits kept on coming. 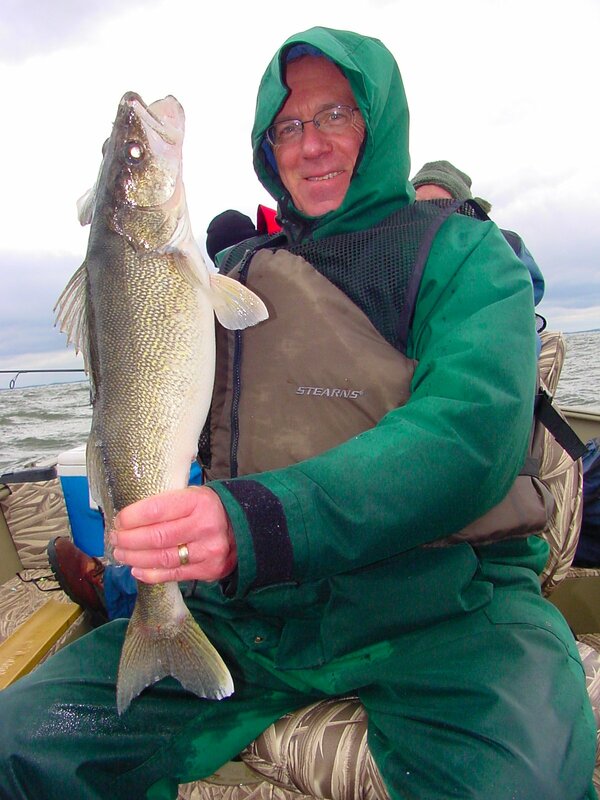 Even though the shoreline fishing in 4 to 6 feet of water was fairly reliable, the Walleye were already using the the shallow rocks away from the shoreline too. We spent a fair amount of time fishing the more isolated rocks and found Walleyes on the tops in about 6 feet of water. Once we moved to about 8 feet we caught mainly Drum. My daughter Katie has proclaimed the Sheep Head (Freshwater Drum) her new favorite fish and we saved a batch of those to eat too. I know it doesn't sound right, but they really are very good. I'll expand on that in the next couple of days as I get more time. Until then, good luck on the lake.